User reports and various data suggests even after the Iranian government removed censorship on the popular messaging and social media platform, they were still slowing down speeds. Image remixed by Mahsa Alimardani. A version of this post was written by Mahsa Alimardani  for ARTICLE19  and republished here under a content partnership. At the height of this winter's protest movement in Iran , there was a temporary ban on the Telegram messaging app, alongside the other popular foreign social media platform, Instagram. This lasted from 30 December 2017 to 13 January 2018. Although temporary, the ban had big implications in Iran, where the IP-based messaging app is immensely popular. Telegram dominates  the messaging app market inside of Iran and is seen as the central (private and public) communication platform for Iranians. Out of a total population of 80 million people, 50 million Iranians  have Internet access, and among those users, 45 million are on Telegram. Telegram’s public channels boast a wide array of topics, both political and quotidian, some of which are opposition diaspora channels, which ordinarily would be censored on other platforms. While the temporary ban was widely acknowledged, new evidence indicates that the government throttled or slowed connection speeds to the platform in the days after it lifted the block on the platform. This adds a new layer of concern to the issue of Iran’s attempts to control and tighten the net. The ban on telegram — and indications of throttling — cast doubt on the discourse of opening up the internet that the administration of President Hassan Rouhani had promised to improve. One of the greatest achievements of the Rouhani administration in promoting Internet freedom has been their success at keeping platforms like Instagram and Telegram uncensored against efforts of the more conservative and hardline elements of leadership in the country. But efforts by the Rouhani administration to re-open platforms such as Twitter that have been blocked since 2009 seem more unlikely after the events surrounding Telegram. The decision to block Telegram was a violation of due process and the rule of law, imposed by various security agencies  within the country working outside the bounds of official law and associated protocols. According to provisions of the Computer Crimes Law and the multi-agency body of the Supreme Council of Cyberspace, multiple authorities should review and approve such decisions before they are acted upon. Statements by Minister of Information Communication and Technology Mohammad Javad Azari Jahromi later indicated the decisions were made by the Supreme National Security Council. The use of communication applications such as Telegram and Instagram should be always seen as tools that enhance the freedom of expression and access to information of Iranians, as enshrined in Article 19 of ICCPR. The reports that @telegram  has been unblocked in Iran are consistent with our data, however, the speed of access to @telegram  in Iran hasn't reached its pre-blocking level. We are analyzing the traffic to understand the reason for this before making any announcements. Data from the University of Tehran’s social lab demonstrated that the number of posts on Persian public channels and the number of views on these posts struggled to return to the same levels after the block was removed (the pink area is the period of blockage). Levels only returned to previous numbers around 20 January 2018. Yellow represents the amount of posts, blue represents the amount of views on posts. The section in pink represents the period where blocking occurred from 31 December 2017 to 13 January 2018. 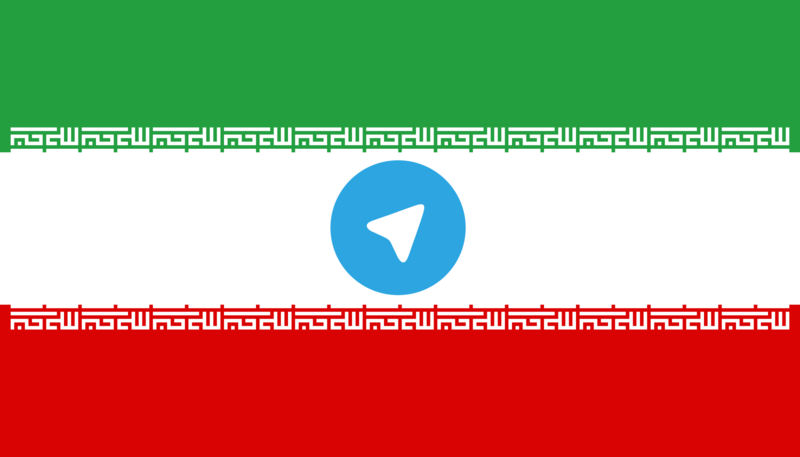 The period following blocking appears to struggle to return to the levels of views and content shared on Persian Telegram channels. Previous decreases were caused by things like earthquakes. Data from the University of Tehran social labs and visualized by ARTICLE19. 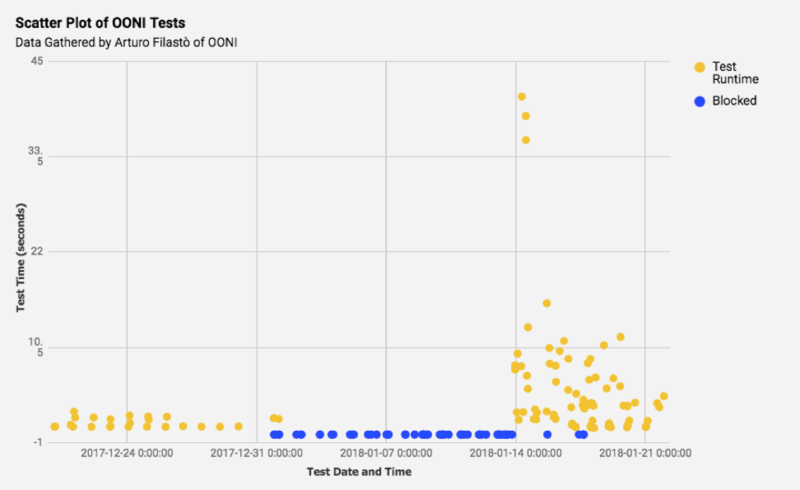 Test results from the Open Observatory of Network Interference (OONI), an initiative that uses remote probes to test for technical internet censorship around the world, showed a slow return on test times when they probed for censorship results from the Telegram app and web version within Iran. OONI probes testing the Telegram app and Telegram web browser in Iran for blocks. The period after the block (the red dots that end when the censorship ended on 13 January 2018) shows slower connection speeds, correlating to statements by users, Telegram’s CEO Durov, and other user statistics. Graph produced by Arturo Filasto, the co-founder and lead software developer for OONI. Telegram itself has released no data about activity in Iran since Durov’s 15 January 2018 statement, in keeping with its characteristic lack of transparency  in documenting government interference with its platform. The data from the University of Tehran and the OONI probes are not exact science. But when combined with anecdotal user reports, they give a strong indication that authorities were continuing to limit the application’s use after the ban was lifted, in further violation of internet access obligations that the Rouhani administration has pledged to meet, both at the national and international levels. The government itself has made no official statements on whether or not it is throttling connections. Many users were still reporting that slow download speeds were posing hurdles to their business dealings. 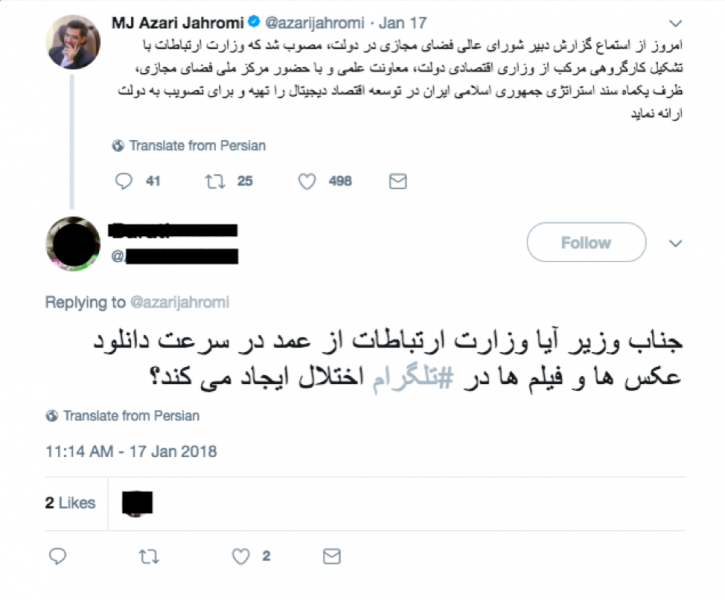 On 17 January 2018, Minister Jahromi tweeted that he was meeting with the Supreme Council for Cyberspace to coordinate their policy on digital economy, in the wake of the effects of filtering on businesses. Users started to question the Ministry’s role in the slow download speeds, but got no response from the typically vocal Minister. Minister Jahromi on 17 January tweets: “After hearing from the Supreme Council of Cyberspace today, it was approved by the Ministry of Communications, with the formation of a working group consisting of the Minister for Economy, a deputy of the scientific community, with the presence of the National Cyberspace Center, will prepare within a month the document on the strategy of the Islamic Republic of Iran in developing the digital economy, and submit to the government for approval.” In response, one of Jahromi’s followers asked “Mr. Minister, is the Ministry of ICT deliberately slowing down the download speeds for pictures and films on Telegram?” Jahromi gave no response. Given this evidence, it would behoove Iran’s Ministry of ICT, a institution part of the elected Rouhani administration, in place to represent the concerns of the Iranian people, to transparently document the means and extent at efforts to control online communication. Furthermore, Telegram has not responded to how their infrastructure inside of the country was affected while the government implemented a ban on the platform. In July 2017, the company moved its Content Delivery Networks (CDNs) into Iran and began hosting public media on the platform's channel on servers inside of the country, in order to increase download speeds. Iranians would also be better served by Telegram if the company released any data bearing evidence of government disruptions or other types of interference in their service from January 15. While Telegram is now accessible, both the government and the company should place mechanisms of accountability and process in place to ensure that access to information — regardless of politics or company policy — is a guarantee for Iranians, regardless of politics.